Krytox™ vacuum pump fluids are used in applications where conventional vacuum pump oils cause safety, waste disposal, and maintenance problems. They are nonflammable and eliminate the chance of fire in pumps. They are nonreactive and safe to use in oxygen systems. They can replace competitive PFPE fluids as well as any other type of vacuum fluid. 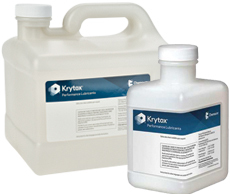 Krytox™ fluids do not contain acetal groups, which are susceptible to attack by Lewis acids. This gives Krytox™ superior stability as a vacuum pump fluid. Krytox™ vacuum fluids are precisely distilled to provide low vapor pressures and superior performance. In addition, Krytox™ fluids are recyclable.